Another parable he proposed to them, saying: The kingdom of heaven is likened to a man that sowed good seeds in his field. But while men were asleep, his enemy came and oversowed cockle among the wheat and went his way. And when the blade was sprung up, and had brought forth fruit, then appeared also the cockle. And the servants of the goodman of the house coming said to him: Sir, didst thou not sow good seed in thy field? whence then hath it cockle? And he said to them: An enemy hath done this. And the servants said to him: Wilt thou that we go and gather it up? 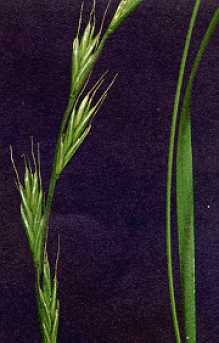 And he said: No, lest perhaps gathering up the cockle, you root up the wheat also together with it. 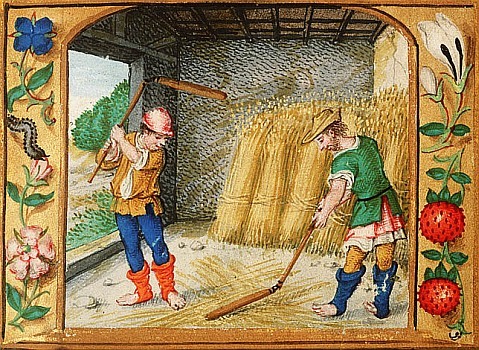 Suffer both to grow until the harvest, and in the time of the harvest I will say to the reapers: Gather up first the cockle, and bind it into bundles to burn, but the wheat gather ye into my barn. What is the difference between this, and the parable before it? There He speaks of them that have not at all holden with Him, but have started aside, and have thrown away the seed; but here He means the societies of the heretics. For in order that not even this might disturb His disciples, He foretells it also, after having taught them why He speaks in parables. The former parable then means their not receiving Him; this, their receiving corrupters. For indeed this also is a part of the devil's craft, by the side of the truth always to bring in error, painting thereon many resemblances, so as easily to cheat the deceivable. Therefore He calls it not any other seed, but tares; which in appearance are somewhat like wheat. Then He mentions also the manner of his device. For "while men slept," saith He. It is no small danger, which He hereby suspends over our rulers, to whom especially is entrusted the keeping of the field; and not the rulers only, but the subjects too. And He signifies also that the error comes after the truth, which the actual event testifies. For so after the prophets, were the false prophets; and after the apostles, the false apostles; and after Christ, Antichrist For unless the devil see what to imitate, or against whom to plot, he neither attempts, nor knows how. Now then also, having seen that "one brought forth a hundred, another sixty, another thirty," he proceeds after that another way. That is, not having been able to carry away what had taken root, nor to choke, nor to scorch it up, he conspires against it by another craft, privily casting in his own inventions. And what difference is there, one may say, between them that sleep, and them that resemble the wayside? That in the latter case he immediately caught it away; yea, he suffered it not even to take root; but here more of his craft was needed. And these things Christ saith, instructing us to be always wakeful. For, saith He, though thou quite escape those harms, there is yet another harm. For as in those instances "the wayside," and "the rock," and "the thorns," so here again sleep occasions our ruin; so that there is need of continual watchfulness. Wherefore He also said, "He that endureth to the end, the same shall be saved." Something like this took place even at the beginning. Many of the prelates, I mean, bringing into the churches wicked men, disguised heresiarchs, gave great facility to the laying that kind of snare. For the devil needs not even to take any trouble, when he hath once planted them among us. And how is it possible not to sleep? one may say. Indeed, as to natural sleep, it is not possible; but as to that of our moral faculty, it is possible. Wherefore Paul also said, "Watch ye, stand fast in the faith." After this He points out the thing to be superfluous too, not hurtful only; in that, after the land hath been tilled, and these is no need of anything, then this enemy sows again; as the heretics also do, who for no other cause than vainglory inject their proper venom. And not by this only, but by what follows likewise, He depicts exactly all their acting. For, "When the blade was sprung up, saith He, "and brought forth fruit, then appeared the tares also;" which kind of thing these men also do. For at the beginning they disguise themselves; but when they have gained much confidence, and some one imparts to them the teaching of the word, then they pour out their poison. But wherefore doth He bring in the servants, telling what hath been done? That He may pronounce it wrong to slay them. And He calls him "an enemy," because of his harm done to men. For although the despite is against us, in its origin it sprang from his enmity, not to us, but to God. Whence it is manifest, that God loves us more than we love ourselves. And see from another thing also, the malicious craft of the devil. For he did not sow before this, because he had nothing to destroy, but when all had been fulfilled, that he might defeat the diligence of the Husbandman; in such enmity against Him did he constantly act. And mark also the affection of the servants. I mean, what haste they are in at once to root up the tares, even though they do it indiscreetly; which shows their anxiety for the crop, and that they are looking to one thing only, not to the punishment of that enemy, but to the preservation of the seed sown. For of course this other is not the urgent consideration. Wherefore how they may for the present extirpate the mischief, this is their object. And not even this do they seek absolutely, for they trust not themselves with it, but await the Master's decision, saying, "Wilt Thou?" What then doth the Master? He forbids them, saying, "Lest haply ye root up the wheat with them." And this He said, to hinder wars from arising, and blood and slaughter. For it is not right to put a heretic to death, since an implacable war would be brought into the world. By these two reasons then He restrains them; one, that the wheat be not hurt; another, that punishment will surely overtake them, if incurably diseased. Wherefore, if thou wouldest have them punished, yet without harm to the wheat, I bid thee wait for the proper season. But what means, "Lest ye root up the wheat with them?" Either He means this, If ye are to take up arms, and to kill the heretics, many of the saints also must needs be overthrown with them; or that of the very tares it is likely that many may change and become wheat. If therefore ye root them up beforehand, ye injure that which is to become wheat, slaying some, in whom there is yet room for change and improvement. He doth not therefore forbid our checking heretics, and stopping their mouths, and taking away their freedom of speech, and breaking up their assemblies and confederacies, but our killing and slaying them. But mark thou His gentleness, how He not only gives sentence and forbids, but sets down reasons. What then, if the tares should remain until the end? "Then I will say to the reapers, Gather ye together first the tares, and bind them in bundles to burn them. "He again reminds them of John's words,introducing Him as judge; and He saith, So long as they stand by the wheat, we must spare them, for it is possible for them even to become wheat but when they have departed, having profiled nothing, then of necessity the inexorable punishment will overtake them. "For I will say to the reapers," saith He, "Gather ye together first the tares." Why, "first?" That these may not be alarmed, as though the wheat were carried off with them. "And bind them in bundles to burn them, but gather the wheat into my barn." Though we have already, in previous sections, according to our ability discussed these matters, none the less shall we now say what is in harmony with them, even if there is reasonable ground for another explanation. And consider now, if in addition to what we have already recounted, you can otherwise take the good seed to be the children of the kingdom, because whatsoever good things are sown in the human soul, these are the offspring of the kingdom of God and have been sown by God the Word who was in the beginning with God, (John 1:2) so that wholesome words about anything are children of the kingdom. But while men are asleep who do not act according to the command of Jesus, Watch and pray that you enter not into temptation, (Matthew 26:41) the devil on the watch sows what are called tares — that is, evil opinions — over and among what are called by some natural conceptions, even the good seeds which are from the Word. And according to this the whole world might be called a field, and not the Church of God only, for in the whole world the Son of man sowed the good seed, but the wicked one tares — that is, evil words — which, springing from wickedness, are children of the evil one. And at the end of things, which is called the consummation of the age, there will of necessity be a harvest, in order that the angels of God who have been appointed for this work may gather up the bad opinions that have grown upon the soul, and overturning them may give them over to fire which is said to burn, that they may be consumed. And so the angels and servants of the Word will gather from all the kingdom of Christ all things that cause a stumbling-block to souls and reasonings that create iniquity, which they will scatter and cast into the burning furnace of fire. Then those who become conscious that they have received the seeds of the evil one in themselves, because of their having been asleep, shall wail and, as it were, be angry against themselves; for this is the gnashing of teeth. (Matthew 13:42) Wherefore, also, in the Psalms it is said, They gnashed upon me with their teeth. Then above all shall the righteous shine, no longer differently as at the first, but all as one sun in the kingdom of their Father. (Matthew 13:43) Then, as if to indicate that there was indeed a hidden meaning, perhaps, in all that is concerned with the explanation of the parable, perhaps most of all in the saying, Then shall the righteous shine as the sun in the kingdom of their Father, the Saviour adds, He that has ears to hear, let him hear, (Matthew 13:43) thereby teaching those who think that in the exposition, the parable has been set forth with such perfect clearness that it can be understood by the vulgar, that even the things connected with the interpretation of the parable stand in need of explanation. 1 "Cockle," in addition to referring to a type of mollusk, refers to a type of weed. My dictionary says: "any of several weedy plants of the pink family; especially : CORN COCKLE." 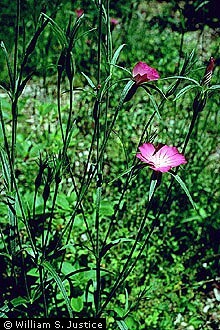 And for "Corn Cockle," it reads: "Corn Cockle: an annual hairy weed (Agrostemma githago) of the pink family with purplish red flowers that is found in grainfields." "Cockle" is also translated "tare" in some versions (such as the King James Version, for ex., in which verse 25 reads, "But while men slept, his enemy came and sowed tares among the wheat, and went his way."). "Tare" refers to a weed known as "darnel." Anyway, hence the phrase "the tares among the wheat."